Digital HD and Disney Movies Anywhere October 7, 2014! 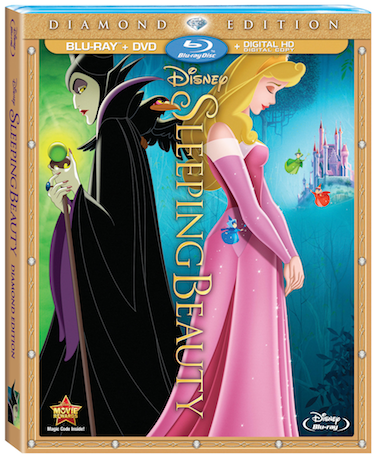 BURBANK, Calif. May 9, 2014 – Finally releasing from the Disney Vault, Disney’s ultimate princess fairytale classic “Sleeping Beauty” will be available for the first time on Diamond Edition Blu-ray, Digital HD and Disney Movies Anywhere on October 7, 2014. Experience all of the pageantry and power of this wondrous tale on Blu-ray – and for the first time on Digital HD – with incredible high definition picture, thrilling, soaring sound, and all-new Diamond Edition special features that make this a must-own for every family’s classic collection! The Curse is Fulfilled – The three good fairies have just returned Aurora to the castle and give her a crown. They leave the room to give Aurora some time alone…but Maleficent pays her a visit. Arrival Of Maleficent (Alternate Scene) – Maleficent arrives uninvited to the christening of the Princess Aurora. The Sound Of Beauty: Restoring A Classic – This featurette covers the creation of the 7.1 mix of the score of Sleeping Beauty that was done for Blu-ray, using the source tapes from the original recording sessions resulting in an audio experience of superior quality with greater detail and fidelity that you have ever heard before. Picture Perfect: The Making Of Sleeping Beauty – Discover the behind-the-scenes magic that transformed a beloved fairy tale into a cinematic work of art. Legendary Animators, actors and film historians reveal the secrets behind Disney’s masterpiece. Eyvind Earle: A Man And His Art – Early in his career, renowned American Artist Eyvind Earle worked as a background painter at the Walt Disney Studio. Walt Disney liked his work so much that he entrusted him with the assignment to be the Art Director for Sleeping Beauty. This was the first time that one artist was given the responsibility for the entire look on one of Disney’s animated features. This piece follows Earle’s development as an artist and his years at the Studio.